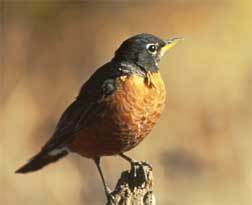 Not as you might think, some Roman bath house excavation but Turdus migratorious, known to his friends as the American Robin; and the star of today's Londonist animal post. Turdus's landing is a big deal, since this is the first time one of these little critters has been spotted in London, and the RSPB have despatched their man to the Denman Road are of Peckham to confirm. The sighting has drawn a number of bird watchers to Peckham; probably the first time any of them have been ornithologists though. They are looking into different gardens and some have their binoculars trained on the chimney of a house. Are we sure this isn't yet another police stakeout cover story? It's quite tame, but not as friendly as a robin, I'll miss it when it goes.